Dutch superyacht builder ICON in collaboration with Austrian design house Motion Code: Blue will debut a new concept at this year’s Monaco Yacht Show, the Selazzio 95 Sea Palace. 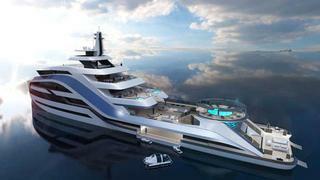 ICON has allowed Boat International to bring you details and images of the stunning 95m superyacht. Noticing the trend of explorer yachts with ample outdoor deck spaces, the superyacht builder and designer worked together to develop a modern explorer yacht. Far from your typical-looking explorer yacht, Selazzio falls into this category not for any traditional explorer-yacht styling but for her planned long range. The eye-catching design features an entirely open, large aft deck and fittingly expansive beach club. The Selazzio 95 is based on an existing 95m ICON hull platform, complemented by a 22m beam providing spacious living spaces. The proposed interior design features columns and spherical shapes. ICON is showing off the new design at the Monaco Yacht Show this week at Darse Nord stand QD 65.